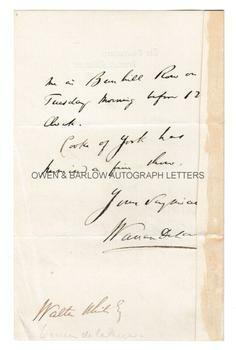 WARREN DE LA RUE autograph letter Signed. British chemist and astronomer. Best known for his pioneering work in astronomical photography. His detailed photographs of the Moon are amongst the first ever taken. ALS. 2pp. The Observatory, Cranford, Middlesex. June 5th 1864. To Walter White [Assistant secretary and librarian to the Royal Society]. 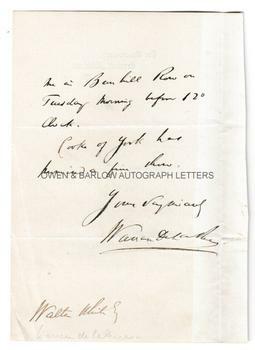 "Many thanks for speaking with Mr M. Callum [?] and arranging for his pictures, I have directed a card to him. I shall be obliged by your engaging Mr Charlton to collect and fit up - carpenter will be found by Willis. Perhaps Mr Charlton would call upon me in Bunhill Row on Tuesday morning before 12 o'clock. Cooke of York has promised a fine show. Yours very sincerely, Warren De La Rue." 8vo. Approx 6.25 x 4 inches (15.5 x 10 cms). Old folds. The blank leaf of the bifolium excised to a stub that has previously been used for mounting purposes, with very slight mounting traces to stub, else in fine condition. Warren De La Rue had become President of the Royal Astronomical Society in 1864 (having previously been President of the Royal Chemistry Society). Also in 1864 he received the Royal Medal of the Royal Society.